With the huge spotlight on Europe, Greece, the US Dollar, Canada, Switzerland, and China, it's easy to lose track of major things outside of mainstream attention. Conservatives swept into power into Australia in September of 2013 in the biggest Labour rout in history. In December of 2013 I wrote Australia's Alleged Conservatives Surrender to Unions; Currency Madness Everywhere. Shockingly, Australian conservatives may not last even one full term. Three days ago The Australian reported Queensland election 2015: Labor on brink of forming government. We have experienced the biggest political earthquake I have ever seen in my home state of Queensland. The government has lost power after one term. The Queensland Premier lost his seat. This after winning the biggest landslide win in history with a mandate to fix the financial mess created by Labor. They held 79 seats to 7. And now they lost. This sort of volatility is now the norm. People hate austerity. People know the party is over and are very surly and angry. These are good elections to lose as there are no easy answers, only very hard, unpopular decisions. We are in for one hell of a ride. Massive impact! Federal election is just under 2 years away. The Prime Minister Tony Abbottis in serious trouble and will battle to hold the top job. A leadership spill is rumored. What follows may not make much sense unless one understands the meaning of "Liberal" in Australian politics. Simply put, liberal means conservative to US readers. With that in mind, let's continue. Please consider Tony Abbott Leadership Now ‘Terminal’. Former Victorian premier Jeff Kennett has unloaded on Tony Abbott’s “terminal” leadership, saying he must be dumped “as quickly as possible” or risk destroying the Coalition government. Liberal MPs Dennis Jensen and Warren Entsch last night publicly declared that the Prime Minister no longer had their support, while former Howard government cabinet minister Mal Brough vouched only “qualified support” for Mr Abbott and demanded he scrap the proposed $5 Medicare co-payment. Mr Kennett, who led Victoria between 1992 and 1999, said Mr Abbott had lost the support of both the Liberal Party base and the broader public. “I think sadly the realisation has dawned on most politicians that where the leadership of the party is now terminal. It needs to be resolved as quickly as possible so that the party can move on,” Mr Kennett told ABC Radio. “Now I say that sadly. I feel very sorry for Tony. He’s a man of very good values. But most of where we are at the moment as a government is self-inflicted. We are 12 weeks away from the 2015 budget and we haven’t passed the 2014 budget. Yesterday, the Sydney Morning Herald reported Liberal MP Dennis Jensen Calls on Tony Abbott to Resign. 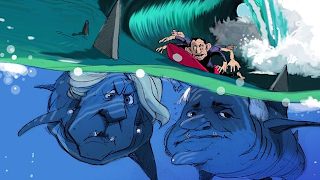 Tony Abbott's leadership has been rocked by a political earthquake and is under imminent threat, with backbench MPs variously calling for the Prime Minister to resign, for a party room ballot next week and expressing doubt he can revive his political fortunes. A day after Mr Abbott used a National Press Club address to dig in and signal unhappy MPs would have to blast him out of office, backbench MPs were in open revolt at the direction of his government on Tuesday night. Liberal MP Dennis Jensen on Tuesday became the first MP to publicly call on Mr Abbott to step aside after weeks of leadership speculation and rising panic on the government backbench about the Coalition's dire position. someone else moved to force him to declare the position vacant and hold a ballot. Queensland Liberal National Party backbencher Warren Entsch told Fairfax Media on Tuesday night that he supported a party room ballot as soon as next week when parliament sits for the first time in 2015. "It [the leadership] needs to be resolved," he said. Jensen added that he didn't believe there was anything Mr Abbott could now do to save his leadership, just a day after the Prime Minister gave a major speech at the National Press Club designed to regain support and buy him some time. The Australian reports Government in Treacherous Waters. The Abbott government is being destroyed before our eyes. The Liberal Party’s frustrations and divisions have cracked wide open. It has taken only 17 months for a sizeable section of the party to announce that Tony Abbott has failed as PM and needs to be liquidated. The internal chaos that ruined the former Labor government has now penetrated the Abbott government. While Abbott’s chances of staging a poll recovery were unlikely, the internal convulsion makes this virtually impossible. As Abbott fights, the debate is shifting to discussion about a new leadership team. Australia now stares down the gun barrel of a third partyroom assassination of a PM in five years. Is there anybody stupid enough to think our politics is not broken? On February 3, the Wall Street Journal reported Australia Cuts Interest Rates to Record Low. Gov. Glenn Stevens said the decision to come off the sidelines for the first time in 18 months was driven by concern that Australia’s resource-rich economy was facing another year of below-average growth. The Australian dollar fell sharply on the announcement of a cut, dropping to a fresh 5½-year low, while the stock market surged to the highest level since May 2008. Australia faces a slowing global economy, especially slowing demand of China for natural resources. A housing bust, baked in the cake is going to tremendously exacerbate Australia's woes. And icing on the ruins is the potential return of Labour. Mish Flashback May 2, 2013: Australia Manufacturing Collapses as Commodity Supercycle Stalls; Labor and Unions Wrecked Australia. The labor party and unions wrecked Australia. This was invisible for years because a housing boom and China-fueled commodity boom masked the untenable nature of wage and property bubble growth. On September 14, prime minister Julia Gillard, leader of the Australian Labor Party will be thrown out of office in a landslide. Unfortunately, it will take years for Australia to recover from the damage caused by Labor. Steve Keen blames both parties. Via email, Keen says "The damage began under Labor with Hawke and Keating, was turbocharged by the Liberals under Howard, and simply maintained by Rudd/Gillard Labor. And unions have lost significant power all the way through--they've been bystanders, not active participants. It's instead been a series of distortions caused by a neoliberal philosophy that is shared by both parties." Hmm. Parties talk differently but act the same. Where have we seen that before? In the US, it's on war, bailouts, and spending that always goes up. Romneycare and Obamacare were the same. For political purposes people pretend differences exist when they don't, except on some social issues. I have been calling for a base metals bust for some time, fueled by a slowdown in China. Michael Pettis at China Financial Markets has been saying the same thing. Indeed, it is analysis from Pettis that influenced my views in the first place. In that post I quoted Australian prime minister (at that time) Julia Gillard who said "There is no question about whether we have a boom, the issue is whether we make it last. Let’s be clear, reports of the mining boom's death are exaggerated." It is not up to Australia at all whether the boom is over or not. The boom is entirely dependent on what China does or doesn't do. Moreover, there is no question the boom is over. The real question is "How big is the bust?" Some put their faith in hyperinflation, commodity supercycles, and the belief China could expand forever. I put my faith elsewhere. Thanks once again to those who helped me reach the right conclusions. Michael Pettis and Steve Keen are in that group. I mentioned both Pettis and Keen above, and both of them recently in Financial Blogger Profile of "Mish" on Equities.Com.